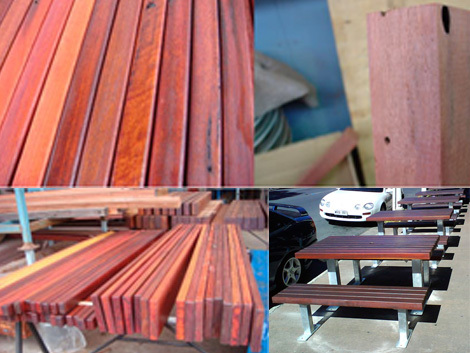 Recycled timber is something that a lot of our clients are interested in, and our Shoreline Range uses recycled Jarrah as a standard. Street & Park support the use of recycled timbers, based on an environmental stand point as well as for its aesthetic purposes. Using a material as character laden as recycled timber can offer a great look and feel to the product, with visible nail and bolt holes. Street & Park Furniture have a high quality standard. We make sure we always supply only the best of what the product has to offer, and fit the material to offer the least effected side, to produce an aesthetically pleasing product. Street & Park also give clients the option of branding their recycled timber with a plaque, so the public can see this material is recycled. It shows the public that the developer/council is environmentally conscious, and is looking at ways of making their street furniture sustainable.